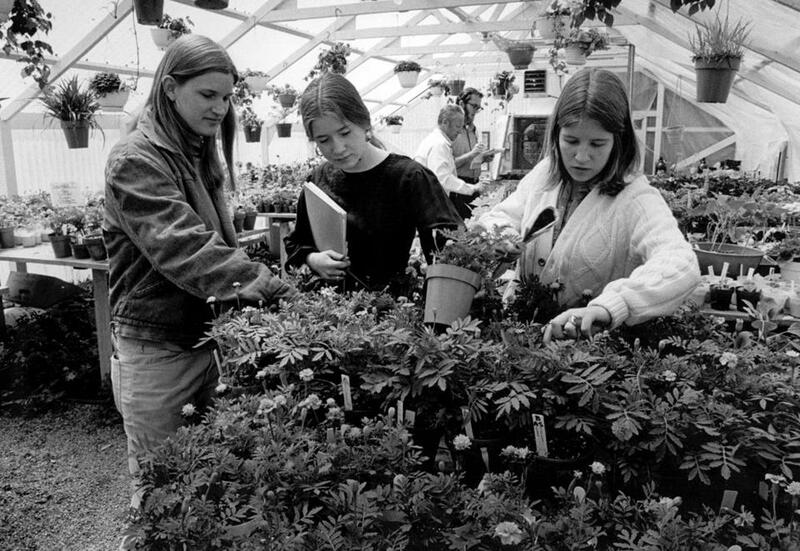 Students worked in the greenhouse, in 1976, at Hampshire College, which encourages educational experimentation. AMHERST — At Hampshire College there are no grades and no majors. Students create their own concentrations, everything from the therapeutic benefits of the flying trapeze and the re-imagined vampire romance novel, to bat biology and autism in the Ghanaian culture. On the 800-acre campus, a student-operated food cooperative called Mixed Nuts sells dried beans, organic Guatemalan coffee, and vegetables from the college farm. The more adventurous have picked wild asparagus from nearby fields. And here, amid farmhouses and wooded hills, protests are plentiful. A senior recently delivered a profanity-laced critique of Hampshire during his commencement speech, the college president just a few feet away. Soon after the election of Donald Trump, students pulled down the American flag flying in the center of campus, drawing nationwide criticism and a counterprotest by veterans groups. If there is an academic base for free-spirited intellectuals and political rebels, Hampshire College has been it for the past half century. But the disclosures last week that Hampshire is looking for a merger partner and may not admit a freshman class this fall has students, faculty, and alumni worried about the school’s survival. They fear something unique could be lost, not just in New England but in higher education nationally. Senning recalled that even his study abroad trip to Costa Rica with Hampshire was more than an extended guided tour. He spent time at the dump learning about the surrounding communities that earned their living sorting through the trash, then lived in a mountaintop village of blackberry farmers. Most graduates think their college was special. But in its brief history, Hampshire has carved a distinctive and offbeat path in higher education. It was the first college to divest its endowment from apartheid South Africa. It dumped standardized testing requirements for applicants in 2014, which an increasing number of mainstream colleges are now considering. In 2018, Hampshire became the first residential college campus to run entirely on solar-generated electricity. In many ways it remains a throwback, holding onto its counterculture spirit through the change of school presidents and transformation of higher education. Hampshire was designed to be an alternative, a place where educational experimentation thrived. But the original idea was borne out of some pretty traditional places. The leaders of nearby Smith College, Amherst College, Mount Holyoke College, and the University of Massachusetts Amherst had, since the 1950s, discussed creating a new college with a “fresh start,” where cutting-edge methods could be tried out. The consortium believed that a college where students taught themselves, athletics played a less prominent role, and professors did not have tenure would cost less. By 1965, a $6 million donation from Amherst alumnus Harold F. Johnson, an anti-tenure advocate, helped purchase 800 acres of orchards and farmland for the new campus. When the first cohort applied to Hampshire, it was little more than a white house and red barn amid open fields. Admissions staff pointed to open spaces where buildings would be. The initial faculty members turned down more lucrative and prestigious jobs elsewhere, believing in Hampshire’s mission to teach students how to think for themselves. The school opened in 1970, the students captivated by the idea of being part of something so different. The daughter of a math teacher and a UMass Amherst professor, Fitzpatrick found her classmates wealthier and seemingly more sophisticated. They soon became her closest friends. And at the time, she wasn’t thinking about what job she might get after graduation. “We were the baby boomers. I went into it with the idea that I was going to study and learn about interesting things and become more educated,” said Fitzpatrick, a history scholar and author who now teaches at the University of New Hampshire. Students came from across the country; for some it was unlike anything they knew. When Patricia Klindienst arrived for her admissions interview, she saw students rappelling on ropes down the outside of the library building. She had dressed carefully in a homemade red dirndl skirt, but the admissions officer was barefoot and sat cross legged on the floor. For a New Jersey girl and the first in her family to go to college, Hampshire was a dream; a full scholarship made it possible for Klindienst to attend. She took one course in the living room of the school president, gathered wild asparagus in surrounding fields, and in her senior year taught a course about women’s literature. “At the period, the valley was this mix of genuine rural living and high culture,” she said. But what students at Hampshire saw as freedom to experiment and pursue their passions, outsiders mocked as a hippie, laid-back education. The label has been hard to shake, no matter the successes of Hampshire graduates: 25 percent go on to start their own businesses, and 65 percent earn advanced degrees, many at elite institutions. Hampshire has produced scientists and entrepreneurs, artists and activists, and several professors. Filmmaker Ken Burns is a graduate, as is actress Lupita Nyong’o, and Stonyfield Farm cofounder Gary Hirshberg. But for alumni, that tree-hugging, purple-haired, pot-smoking stereotype still stings. “There are a lot of cheap shots,” said Jonathan Wright, who was among Hampshire’s first graduates in 1974. He owns a construction company and helped build the R.W. Kern Center on campus. Hardly the prototype of the burly construction guy, Wright sat in the Kern Center last week, pointing out how the exposed metal piping resembled sculpture, riffed about wealth inequality, and mentioned that he is a published poet. Still, for all their achievements, graduates haven’t amassed the kind of wealth that has built big endowments at other schools, Wright said, leaving Hampshire always on the edge of a financial cliff. Hampshire has 1,400 undergraduate students; tuition is $50,000, plus $14,000 for room and board. Its current endowment of $52 million is a fraction of the other four schools in the valley. A quarter of enrollees today are students of color or international students. And its effort to diversify, both racially and economically, has been rocky at times. The 2016 student commencement speaker, Xavier Torres de Janon, spoke bluntly about this, warning administrators they need to provide more support to the increasing number of minority students and address concerns about sexual harassment. And yet, that fiery speech was in a sense a validation of Hampshire’s unusual approach. Administrators reviewed Torres de Janon’s remarks beforehand, and didn’t try to stop him. Now 25 and planning for law school, the native of Ecuador argued it is vital for Hampshire to survive. “I think there’s a need for Hampshire. Eighteen-year-olds in high school want schools that are outspoken and quirky. But doing it half-assed will get it back in the hole,” Torres de Janon said in an interview. The irony for Hampshire’s early graduates is how the current social and political climate is so reminiscent of the turmoil in the late ’60s. The ideals on which Hampshire was founded are the ones that many young people rally behind today, they say. “It seems like a time politically when people should be beating Hampshire’s door down to get in,” said Sig Roos, a past board chairman who graduated in the school’s third class. Still, students are increasingly unable to afford Hampshire, and applications have declined. In the end, practical concerns such as finances could be the downfall of a place designed to free students from the bounds of traditional thinking. When Roos thinks back on his years at Hampshire, some of his fondest memories are of the January term, when the school encourages students to make trips into the wilderness and provides outdoor gear for them. Once Roos trekked with a group to Utah, to re-create the journey of American explorer John Wesley Powell. Another time he hiked the Front Range in Colorado on a trip led by fellow student Jon Krakauer, author of several celebrated books. “Hampshire was encouraging us to grow in every possible way,” Roos said. Now, his daughter has been accepted to Hampshire for the fall, and is waiting to find out if there will even be a freshman class. Deirdre Fernandes can be reached at deirdre.fernandes@globe.com. Laura Krantz can be reached at laura.krantz@globe.com. Follow her on Twitter @laurakrantz.